Here's your opportunity to experience being pampered, while maintaining your privacy at the Enchanted Cottage! Located only three blocks from the beach and one block south of the beautiful Del Mar Plaza, you can enjoy all that the area has to offer without the crowds and mess of 'on-the-sand' properties! The cottage, (which is a NO SMOKING property), is completely landscaped with fountains, flowers, and fruit trees, and enclosed with custom fencing. There is a 'peek-of-the-ocean' view from the front of the house. Indoors, you can relax with a 46' HD flat screen tv, or keep the children entertained with the Play Station 3. The house itself is my personal retreat (although it's close to everything, it's very quiet) and has been in my possession for seven years now. During this time it has been completely renovated, and I continue to treat it like my 'baby'. The furnishings include a cheerful mix of antiques, wicker, French country pieces... the living room features a gas fireplace and overlooks the front gardens and 'peek-of-ocean' view. The dining nook is just off the front entrance and also has windows overlooking the front garden area. The kitchen, located in the center of the cottage, has an arched pass-thru into the living room (so you can cook while still being part of the activities). Featured in the kitchen are a hand-painted floor, Viking appliances (range & dishwasher) in a light yellow ('lemonade' to Viking) and stainless steel. The east end of the kitchen merges into a glassed-in sitting/dining area opening onto the back courtyard and gardens; it is light & airy with sky-lights. The master bedroom (the 'peach' bedroom) features painted French furnishings and has an extremely comfortable double 'pillow' (queen-size) bed; opening onto its own private atrium area, complete with fountain, ferns, and roses, it is very much a haven. Birds of all kinds visit and add their songs to the gardens. A full bathroom with glassed-in shower is adjacent. On the other side of the house are two bedrooms and a separate bath, which includes a shower and large tub. The back bedroom, (the 'green' bedroom) features an antique walnut double bed and dresser set with painted flowers. French doors opening onto the courtyard and gardens create a spacious and airy ambience. For your comfort, the famous 'Temprapedic' mattress (a double) is provided - one of the most comfortable mattresses on which I've ever slept! The front bedroom (the 'blue' bedroom) contains a white wicker day bed which can be set up as a king, two twins, or one twin/daybed - each version contains a double layer of the'Temprapedic' toppers on top of the feather bed and mattress. Roses and fruit trees peek at you through the front window... The blue bedroom looks outon one of the front terraces and gardens and is the sunniest room in the cottage. Everything possible will be done to customize your stay to fit your requirements - including a welcome package w/flowers & wine -or anything else you might need (including maid service for an additional charge). 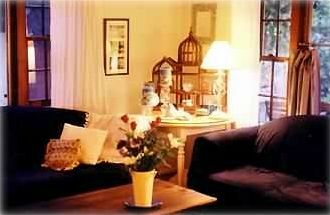 My wish for you is to truly have an enchanted experience at my cottage! Del Mar is one of my favorite places, and when I saw this property I fell in love with it. I love being able to walk to the beach, Del Mar Plaza, around the neighborhood...I love the quiet cozy feel of the area. This cottage has become a sanctuary for me and my friends, and hopefully it will be for you too. You can walk almost everywhere and still be in a quiet beautiful property!